I have been a long-time fan of Amy Small, the owner and creator of Knit Collage! Amy’s yarns are so unique and immediately identifiable as they are unlike any on the market with their beautiful blend of colours and touch of whimsy. 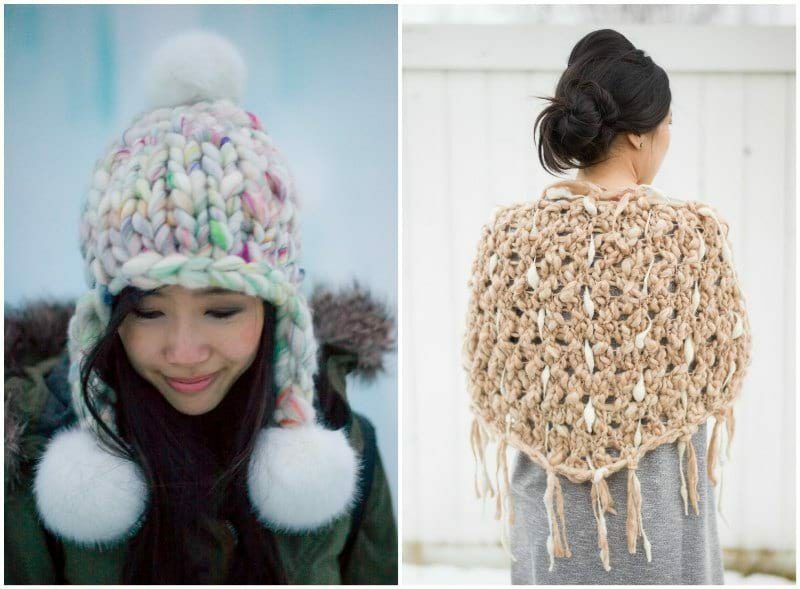 I have had the pleasure of working with some of her dreamy yarns with the projects pictured below: the Pom Bomb Hat and Dash Shawl (click the projects to see my previous blog posts about them). Amy started Knit Collage in 2010 as she fell in love with hand spinning. Taking inspiration from the places that she has traveled to such as India and Hong Kong, she continually challenges herself to come up with new colors and spinning techniques. All the Knit Collage yarns are dyed, carded, and spun in Punjab, India by a team of women who Amy taught. Amy also has a weekly podcast called “Collage Creative” in which she interviews women and men in the creative field who are living life on their own terms, uncovering their motivations, daily routines, and practices. I was thrilled that I could participate in the Fall/Winter 2018 Knitalong as I had my eye on a certain design that looked right up my alley! For this knitalong, Amy had 4 different style options available- as soon as I saw the Cozy Thoughts Colorwork Sweater, I knew I wanted to give it a try! I have always wanted to try doing colorwork in knitting, and the cardigan looked so luxurious and eye-catching. 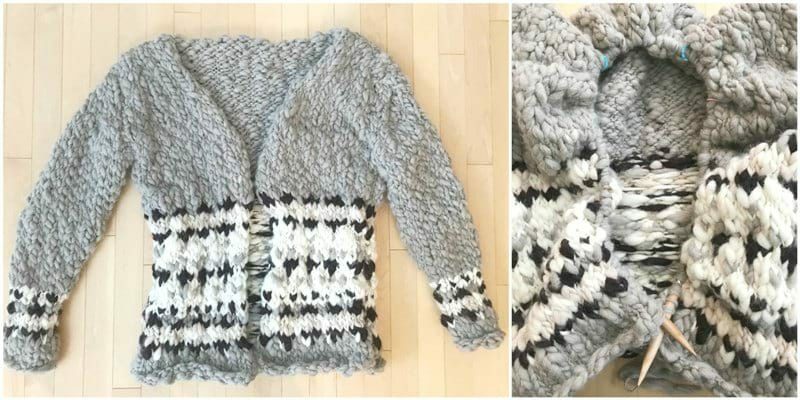 Amy offered this particular cardigan in a variety of different color combinations, but I opted to work with the same colour palette as shown in the original photo as I loved the neutral, earthy tones. When my knitalong package arrived, I was ecstatic to open it up and see all the beautiful thick and thin Sister Yarn in a variety of shades: Driftwood, Oatmeal Heather, Soft Ivory, and Rich Eggplant. Also included were size US 17 (15 mm) 40″ ChiaoGoo circular knitting needles, a measuring tape, darning needle, and two large ChiaoGoo stitch markers (which I LOVE using by the way). As a part of the knitalong, each participant had access to all the knitalong patterns and instructional videos on an online course platform called Teachable (note that the pattern was only available through the knitalong and currently cannot be purchased separately). Each week, a new video was posted giving instructions on how to complete that particular section. I followed along with the schedule and found the videos very helpful as I tackled reading colorwork from a chart for the first time. All the knitalong participants joined a private Facebook group, and it was so much fun showing each other our progress along the way and encouraging one another! I thoroughly enjoyed knitting the different panels as it worked up very quickly with the large needles and thick yarn. It was so much fun seeing the color pattern build up, and I found myself chanting, for example, “Ivory, Eggplant, Driftwood, Driftwood” as I got into the rhythm of each row. I did have a few questions along the way, and Amy and her staff were very quick to respond and provide help. 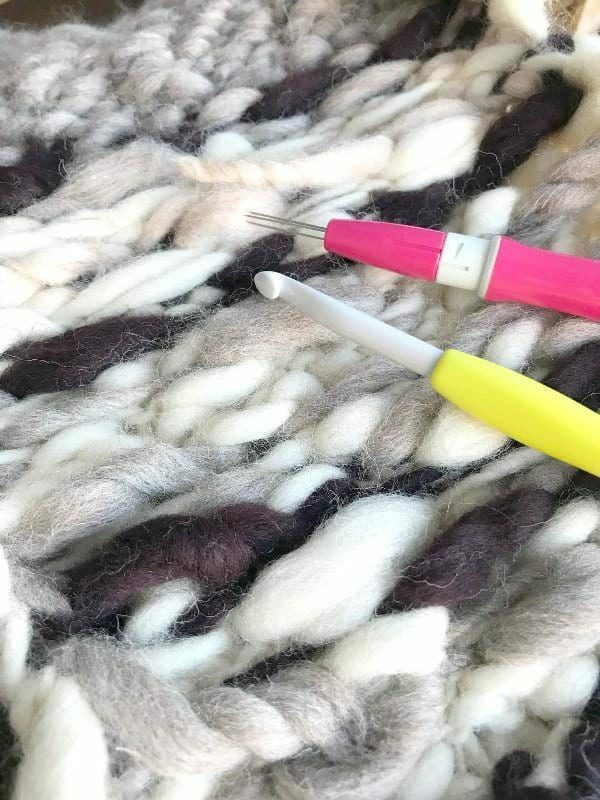 Since Sister yarn is 100% wool, it lends itself very well to felting the yarn ends together with a felting needle! As you can imagine, there were many ends due to the colorwork, so I put my trusty Clover felting needle tool to great use. I used a crochet hook to weave in the ends and then felted them into place. I also used a felting needle when I needed to join a new ball of yarn. I shared this tip in the Facebook group, and many people found it helpful! You can read my full “How to Felt Yarn Ends Together” tutorial and blog post HERE! After I seamed together all the parts, it was time to pick up stitches around the collar and work the ribbing! I was a little concerned that I would run out of yarn, but I managed to have enough. The shawl collar was not as big as the one pictured in the original photo, but I am glad I had enough yarn to finish up the cardigan! Other things to note: I had to make sure I did not work the colorwork too tightly and loosen up a bit when switching colours. Some noted that the sleeves were tight around the wrist- it fit me but I could see how it could be a bit snug for others. I ended up cuffing/rolling up the sleeves when wearing the cardigan since they were long for me- and for those interested, I knit the size Small! In the pattern, you can add optional button holes, and I decided to add them as I loved the look of the buttons on the model in the photo. I went to Fabricland and found these wooden toggle buttons- however, as you can see in the top right picture, they were way too small for the size of the button hole. Thus, I used the remaining Sister yarn to sew each hole more shut, making them smaller so that the button could slip through without falling out easily again. After sewing on the buttons and blocking the bottom of my cardigan (the stockinette was causing it to curl up), I was THRILLED to finally wear my gorgeous cardigan! 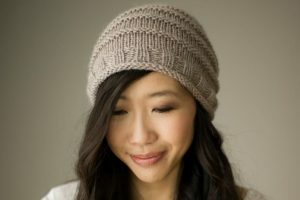 It is incredibly cozy and warm since it is 100% wool, and the neutral shades are sooo pretty and completely my style! I ended up finishing this cardigan much later than I anticipated as we went on several trips and this project got put on the backburner. However, I am very glad I finished it now as it is the perfect weather to wear these chunky sweaters as jackets! I would not have been able to wear this cardigan under my winter jacket, but now I can proudly show off this beauty with the chilly (but not frigidly cold) weather! Thick and thin yarn provides such a unique and gorgeous texture as each stitch is a varied size- I think it gives so much character and visual interest! I had so much fun learning how to read colorwork from a chart and I am delighted with how my Cozy Thoughts Colorwork Sweater turned out! I am so proud of it, and it feels like I am wearing a beautiful piece of art when I go out and about wearing this handmade cardigan! 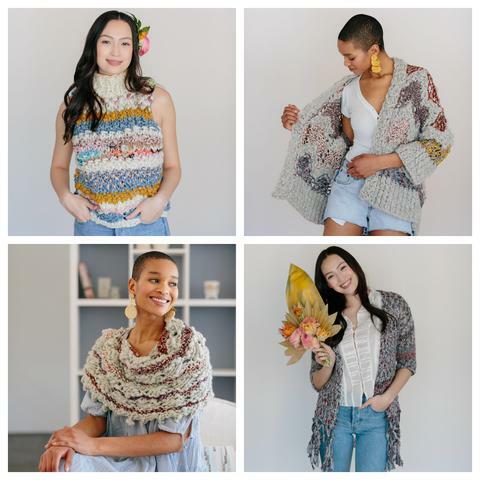 Amy is launching her Spring Knitalong with four new designs: the Sunwoven Tank,Garden Party Sweater, Constellation Shawl, and Floret Cardi. If you have been wanting to try out some of her gorgeous yarns, now is a great opportunity to tackle a new project with this knitalong! Amy provides everything you need to successfully knit these projects with plenty of helpful video tutorials through Teachable and round-the-clock support from the Knit Collage team whenever you need it. Breaking down each project into chunks week by week helps you stay on task and reach your goal. The camaraderie and encouragement through the Facebook group is wonderful as you can see everyone’s colour choices and progress as you spur each other on and get the motivation to finish your project. Also, a portion of the proceeds will be going to support an orphanage in India called Palna House that Amy has personally chosen and visited so that she can help give back through her Knitalong. The Spring Knitalong Kits are available HERE and will be available for one week only from April 11-18 (these exclusive patterns will only be available through the knitalong until Amy releases them in about a year from now). 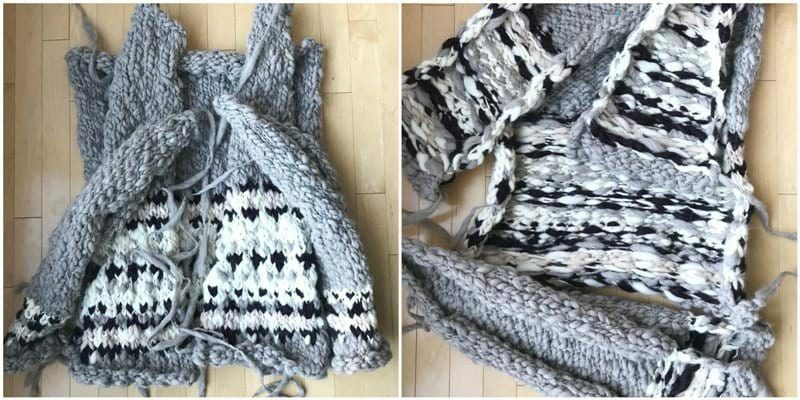 Keep in mind that when you buy the kit for one style, you get access to all four patterns and accompanying tutorials (there is also a bonus 5th pattern being thrown in called the “Beachy Cardi Sweater”). Shipping is free within the US and up to $15 off when shipping to other countries (for example, if shipping to Australia is $20, you will get $15 off and only pay $5). Amy has filmed videos detailing each style option and offers a variety of colour choices, so be sure to check them all out HERE! It is so empowering whenever you learn a new skill and complete such a large project, and I am so thankful that I could participate in this knitalong! Reading a colorwork chart seems much less daunting now, and I cannot wait to wear my incredibly cozy and stylish cardigan more during cooler days. 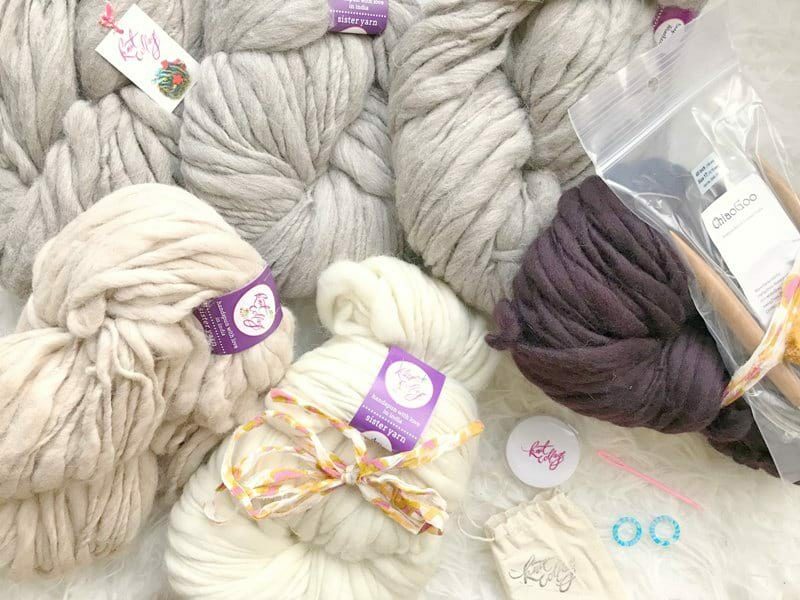 Let me know if you will be joining the Knit Collage Spring Knitalong and which design you are thinking of trying- do you have any guesses which one I will be knitting? Note: Thank you to Amy of Knit Collage for providing me with the Cozy Thoughts Colorwork Sweater Kit. All opinions and views expressed are 100% my own! Links directing to Knit Collage are affiliate links!